No dog owner should be without a handful of good quality dog towels. They serve a multitude of different uses so it's important to make sure that you have at least two available for use at any given time since one is always likely to be in the wash. It's a great idea to keep a dog towel with you whenever you take him for a walk. Some are small enough that they can be folded up and kept in your pocket, or you could choose a larger one and leave it in the car. Whether your dog is swimming in the sea, romping through a muddy forest or racing in and out of hedgerows, you'll find that a dog towel is perfect for cleaning him up and minimising the spread of mess and water. Dog towels have the added feature of being perfect to wrap him up and keep him warm after a particularly wet and wintry walk. Dog towels are a brilliant item to have in your home too. We all know how messy a dog bath can get, but having dog towels to hand means that you can easily keep all the water where it should be. Dog towels are also available as a bathrobe for your pooch (how cute! ), and when you've got him warm and dry you can use the towel to mop up any residual water on the floor before throwing it in the washing machine to clean. When buying dog towels it's a great idea to opt for microfibre which is a highly absorbent material and perfect for the job. If you and your dog are on the go a lot then it's a brilliant travel accessory thanks to its many uses, and because the fabric is light it dries really easily. If you travel a lot then opt for a smaller towel (which will usually come in its very own bag for ease of carrying). Because towels and robes are available in a variety of colours, styles and designs, you'll find it easy to choose the perfect one for your dog. When shopping around for dog towels and bathrobes it's important to bear size in mind. Larger dogs will obviously need more coverage to make it worthwhile. 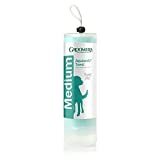 Always go for microfibre - it has been designed for the job and is far more effective than traditional towelling. 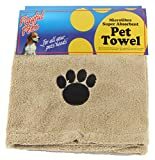 The price of dog towels and bathrobes start from as little as £5, though if you'd like to ensure the comfort of your pet then it's well worth spending a little more as doggy towels around the £15-£20 mark tend to be of a much higher quality. If you really want to spoil your doggie then you could even consider having it personalised with their name!